Recently I was matched up in MyTEAM Online against one of my favorite NBA 2K YouTubers, Big C Richy. Big C Richy posts great videos of different teams and players and they're fun to watch. Be sure to subscribe to his channel below. 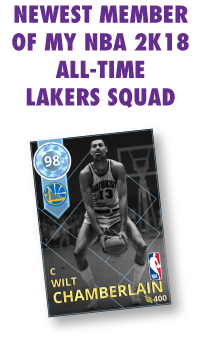 He used his God Squad and I used my All-Time Lakers Squad. When you play against gamers of his caliber your game is naturally elevated which was the case here. I hope you enjoy the video! My younger brother is such a big fan of basketball. To get him undercontrol all you have to do is put a game on, which is what I often do when I babysit him. LakerLiker.com has no affiliation with NBA 2K Sports. Powered by Blogger.